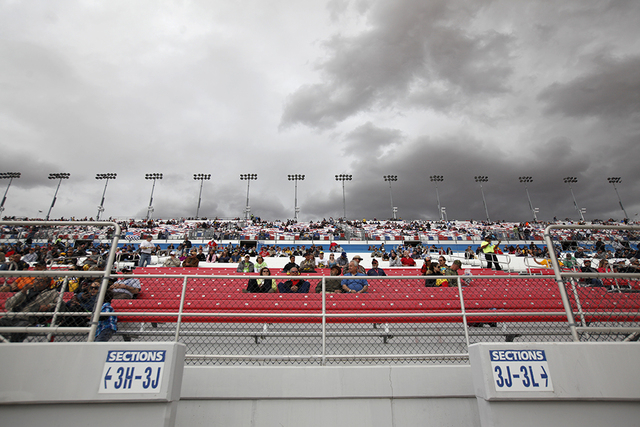 Update: Cars started their engines at 12:52 p.m. and racing is expected to start at about 1 p.m.
High winds and rain have delayed the start of the Kobalt 400 NASCAR Sprint Cup race at Las Vegas Motor Speedway. The green flag was supposed to fly at 12:30 . Track dryers are lapping the track but the 30 mph winds gusts are the bigger concern. “I’ve been at every Cup race since 1985. I’ve never seen wind like this,” said FOX TV NASCAR analyst Micheael Waltrip.